As usual, this method is public and static. But in the place where we are used to seeing void, we see double, which means that the return value from this method is a double. On the other hand, temporary variables like result often make debugging easier, especially when you are stepping through code using an interactive debugger (see Appendix A.6). The type of the expression in the return statement must match the return type of the method. When you declare that the return type is double, you are making a promise that this method will eventually produce a double value. If you try to return with no expression, or an expression with the wrong type, the compiler will generate an error. Since these return statements are in a conditional statement, only one will be executed. As soon as either of them executes, the method terminates without executing any more statements. When x is 0, neither condition is true, so the method ends without hitting a return statement. The error message in this case might be something like “missing return statement”, which is confusing since there are already two of them. But hopefully you will know what it means. Start with a working program and make small, incremental changes. At any point, if there is an error, you will know where to look. Use variables to hold intermediate values so you can check them, either with print statements or by using a debugger. Once the program is working, you can consolidate multiple statements into compound expressions (but only if it does not make the program more difficult to read). The first step is to consider what a distance method should look like in Java. In other words, what are the inputs (parameters) and what is the output (return value)? In this case, the two points are the parameters, and it is natural to represent them using four double values. The return value is the distance, which should also have type double. The return statement is a placeholder that is necessary for the program to compile. At this stage the program doesn’t do anything useful, but it is good to compile it so we can find any syntax errors before we add more code. With these values, the horizontal distance is 3.0 and the vertical distance is 4.0. So the result should be 5.0, the hypotenuse of a 3-4-5 triangle. When you are testing a method, it is helpful to know the right answer. Once we have compiled the stub, we can start adding lines of code one at a time. After each incremental change, we recompile and run the program. If there is an error at any point, we have a good idea where to look: the last line we added. The next step is to find the differences x2 − x1 and y2 − y1. We store those values in temporary variables named dx and dy. The print statements allows us to check the intermediate values before proceeding. They should be 3.0 and 4.0. We will remove the print statements when the method is finished. Code like that is called scaffolding, because it is helpful for building the program, but it is not part of the final product. The next step is to square dx and dy. We could use the Math.pow method, but it is simpler to multiply each term by itself. Again, you should compile and run the program at this stage and check the intermediate value, which should be 25.0. Finally, we can use Math.sqrt to compute and return the result. As you gain more experience programming, you might write and debug more than one line at a time. Nevertheless, incremental development can save you a lot of time. Once you define a new method, you can use it as part of an expression, or build new methods using existing methods. For example, suppose someone gave you two points, the center of the circle and a point on the perimeter, and asked for the area of the circle. Let’s say the center point is stored in the variables xc and yc, and the perimeter point is in xp and yp. The first step is to find the radius of the circle, which is the distance between the two points. Fortunately, we have a method that does just that (distance). The second step is to find the area of a circle with that radius. We have a method for that computation too (calculateArea). This example demonstrates a process called functional decomposition; that is, breaking a complex computation into simple methods, testing the methods in isolation, and then composing the methods to perform the computation. This process reduces debugging time and yields code that is more likely to be correct and easier to maintain. You might have noticed that circleArea and calculateArea perform similar functions. They both find the area of a circle, but they take different parameters. For calculateArea, we have to provide the radius; for circleArea we provide two points. Java uses the second version of calculateArea, which interprets the arguments as two points. In this example, the second version actually invokes the first version. Many Java methods are overloaded, meaning that there are different versions that accept different numbers or types of parameters. For example, there are versions of print and println that accept a single parameter of any data type. In the Math class, there is a version of abs that works on doubles, and there is also a version for ints. Although overloading is a useful feature, it should be used with caution. You might get yourself nicely confused if you are trying to debug one version of a method while accidentally invoking a different one. 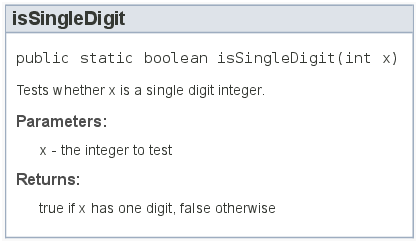 The name of this method is isSingleDigit. It is common to give boolean methods names that sound like yes/no questions. Since the return type is boolean, the return statement has to provide a boolean expression. The first line displays true because 2 is a single-digit number. The second line sets bigFlag to true, because 17 is not a single-digit number. Examples like this one almost read like English: “If is single digit z, print ... else print ...”. In Section 4.9, we discussed how to write documentation comments using /**. It’s generally a good idea to document each class and method, so that other programmers can understand what they do without having to read the code. To organize the documentation into sections, Javadoc supports optional tags that begin with the at sign (@). For example, we can use @param and @return to provide additional information about parameters and return values. Figure 6.1 shows part of the resulting HTML page generated by Javadoc. Notice the relationship between the source code and the documentation. Figure 6.1: HTML documentation for isSingleDigit. Methods with multiple parameters should have separate @param tags that describe each one. Void methods should have no @return tag, since they do not return a value. Now that we have methods that return values, we have a Turing complete programming language. That means Java can compute anything computable, for any reasonable definition of “computable”. This idea was developed by Alonzo Church and Alan Turing, so it is known as the Church-Turing thesis. To give you an idea of what you can do with the tools we have learned, let’s look at some methods for evaluating recursively-defined mathematical functions. A recursive definition is similar to a circular definition, in the sense that the definition refers to the thing being defined. An adjective used to describe a method that is recursive. If you saw that definition in the dictionary, you might be annoyed. But if you search for recursion on Google, it displays “Did you mean: recursion” as an inside joke. Don’t confuse the mathematical symbol !, which means factorial, with the Java operator !, which means not. This definition says that factorial(0) is 1, and that factorial(n) is n * factorial(n - 1). So factorial(3) is 3 * factorial(2); factorial(2) is 2 * factorial(1); factorial(1) is 1 * factorial(0); and factorial(0) is 1. Putting it all together, we get 3 * 2 * 1 * 1, which is 6. Next, we think about the base case. If the argument happens to be zero, we return 1. Otherwise, and this is the interesting part, we have to make a recursive call to find the factorial of n−1, and then multiply it by n.
Since 0 is zero, we take the first branch and return the value 1 immediately. The return value (1) gets multiplied by n, which is 1, and the result is returned. The return value (1) gets multiplied by n, which is 2, and the result is returned. The return value (2) gets multiplied by n, which is 3, and the result, 6, is returned to whatever invoked factorial(3). Figure 6.2 shows what the stack diagram looks like for this sequence of method invocations. The return values are shown being passed back up the stack. 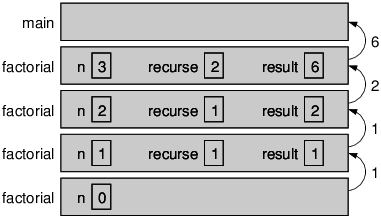 Notice that recurse and result do not exist in the last frame, because when n == 0 the code that declares them does not execute. Figure 6.2: Stack diagram for the factorial method. Following the flow of execution is one way to read programs, but it can quickly become overwhelming. An alternative is the leap of faith: when you come to a method invocation, instead of following the flow of execution, you assume that the method works correctly and returns the appropriate value. In fact, you are already practicing a leap of faith when you use methods in the Java library. When you invoke Math.cos or System.out.println, you don’t examine the implementations of those methods. You just assume that they work properly. You should apply the same reasoning to your own methods. For example, in Section 6.5 we wrote a method called isSingleDigit that determines whether a number is between 0 and 9. Once we convince ourselves that this method is correct – by testing and examination of the code – we can use the method without ever looking at the implementation again. The same is true of recursive methods. When you get to the recursive call, instead of following the flow of execution you should assume that the recursive invocation works. For example, “Assuming that I can find the factorial of n−1, can I compute the factorial of n?” Yes you can, by multiplying by n.
Of course, it is strange to assume that the method works correctly when you have not finished writing it, but that’s why it’s called a leap of faith! If you try to follow the flow of execution here, even for small values of n, your head will explode. But if we take a leap of faith and assume that the two recursive invocations work correctly, it is clear that their sum is the result. A method that does not return a value. A method that returns a value. The type of value a method returns. The value provided as the result of a method invocation. A short-lived variable, often used for debugging. A process for creating programs by writing a few lines at a time, compiling, and testing. A placeholder for an incomplete method so that the class will compile. A process for breaking down a complex computation into simple methods, then composing the methods to perform the computation. To define more than one method with the same name but different parameters. A label that begins with an at sign (@) and is used by Javadoc to organize documentation into sections. A programming language that can implement any theoretically possible algorithm. The product of all the integers up to and including a given integer. A way to read recursive programs by assuming that the recursive call works, rather than following the flow of execution. The code for this chapter is in the ch06 directory of ThinkJavaCode. See page ?? for instructions on how to download the repository. Before you start the exercises, we recommend that you compile and run the examples. If you have not already read Appendix A.7, now might be a good time. It describes JUnit, a tool for efficiently testing value methods. If you have a question about whether something is legal, and what happens if it is not, a good way to find out is to ask the compiler. Answer the following questions by trying them out. What happens if you invoke a value method and don’t do anything with the result; that is, if you don’t assign it to a variable or use it as part of a larger expression? Write a method named isDivisible that takes two integers, n and m, and that returns true if n is divisible by m, and false otherwise. If any of the three lengths is greater than the sum of the other two, you cannot form a triangle. Write a method named isTriangle that takes three integers as arguments and returns either true or false, depending on whether you can or cannot form a triangle from sticks with the given lengths. The point of this exercise is to use conditional statements to write a value method. Many computations can be expressed more concisely using the “multadd” operation, which takes three operands and computes a * b + c. Some processors even provide a hardware implementation of this operation for floating-point numbers. Create a new program called Multadd.java. Write a method called multadd that takes three doubles as parameters and that returns a * b + c.
Write a main method that tests multadd by invoking it with a few simple parameters, like 1.0, 2.0, 3.0. Hint: The method for raising e to a power is Math.exp. In the last part of this exercise, you need to write a method that invokes another method you wrote. Whenever you do that, it is a good idea to test the first method carefully before working on the second. Otherwise, you might find yourself debugging two methods at the same time, which can be difficult. One of the purposes of this exercise is to practice pattern-matching: the ability to recognize a specific problem as an instance of a general category of problems. The purpose of this exercise is to make sure you understand logical operators and the flow of execution through value methods. In this exercise, you will use a stack diagram to understand the execution of the following recursive program. Draw a stack diagram showing the state of the program just before the last invocation of prod completes. Explain in a few words what prod does (without getting into the details of how it works). Rewrite prod without the temporary variables recurse and result. Hint: You only need one line for the else branch. Exercise 7 Write a recursive method named oddSum that takes a positive odd integer n and returns the sum of odd integers from 1 to n. Start with a base case, and use temporary variables to debug your solution. You might find it helpful to print the value of n each time oddSum is invoked. Write a method called ack that takes two ints as parameters and that computes and returns the value of the Ackermann function. Test your implementation of Ackermann by invoking it from main and displaying the return value. Note the return value gets very big very quickly. You should try it only for small values of m and n (not bigger than 3). Write a recursive method called power that takes a double x and an integer n and returns xn. Hint: A recursive definition of this operation is xn = x · xn−1. Also, remember that anything raised to the zeroth power is 1. Optional challenge: you can make this method more efficient, when n is even, using xn = ( xn/2 )2.